Scuba unlocks the mysteries of the underwater world and allows you to experience the feeling of weightless flight through the ocean's currents. Uncover dazzling reefs, fascinating shipwrecks, enchanting springs, mysterious caves and an array of marine life. 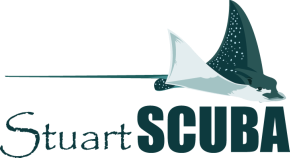 Stuart Scuba strives to make your scuba training fun and convenient. We're a full-service shop that caters to recreational and technical divers, alike. Come dive with us in the warm Gulf Stream waters of the Caribbean year-round from our fleet of dive boats. Discover our beautiful Florida Springs or enjoy the world famous shore diving at Blue Heron Bridge.